The Lovely Horrible Stuff — Eddie Campbell, Dammit! Money makes the world go round, as they say... but HOW, exactly? Award-winning graphic novelist Eddie Campbell (From Hell, Alec) presents a fascinating journey into the wilderness of personal finance. With his trademark blend of research, anecdote, autobiography, and fantasy, Campbell explores how money underwrites human relationships, flowing all around us like the air we breathe — or the water we drown in. 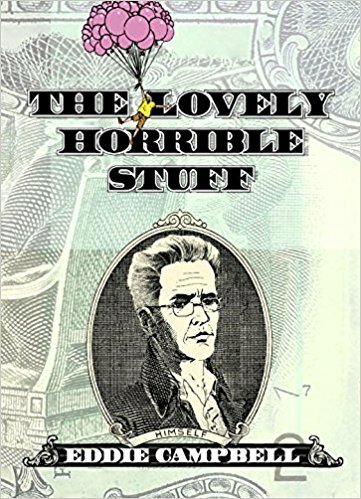 The result is a whimsical graphic essay, deeply grounded in Eddie's personal experiences with "the lovely horrible stuff," ranging from the imaginary wealth of Ponzi schemes and television pilots to the all-too-tangible stone currency of the Micronesian island of Yap. In a world where drawing corporate superheroes requires literally transforming oneself into a corporation (which is kept in a shoebox under the bed), we are in strange territory, indeed. Fortunately, Campbell's wry eye and vivid full-color artwork imbue the proceedings with real humanity, making The Lovely Horrible Stuff an investment that's worth every penny.